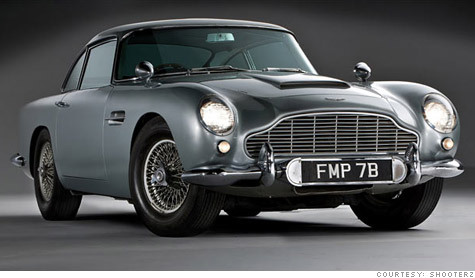 NEW YORK (CNNMoney.com) -- A 1964 Aston Martin used in early James Bond films sold for 4.6 million dollars at a London auction Wednesday. This car was one of only two fully-equipped 1964 Aston Martin DB5s actually used in the early Bond films. In this case, "fully equipped" includes features you don't see on most cars. Among the options included on this model: guns that poke out through the taillights, a license plate that rotates to show different sets of numbers and a removable roof panel to allow easy egress for a passenger in the ejector seat. The car was used in two of the Bond movies. First for the fast-driving sequences in Goldfinger and later -- after it was equipped with James Bond's famous gadgets -- in Thunderball. The car has not been substantially altered since then. In addition to all the gadgetry, the car has a 282-horsepower engine and a top speed of about 145 miles per hour. Minus all the gadgets, a standard 1964 DB5 could go from zero to 60 miles per hour in about 7.1 seconds. After production of the two Bond films was completed, the car was returned to Aston Martin. In 1969, it was purchased for $12,000 by Jerry Lee, a Philadelphia radio executive who has owned the car since. The car has been rarely seen in public, spending most of its life in storage. RM Auctions has done restoration work on the car, which has about 30,000 miles on it. Restorers worked on the car's engine, brakes, exhaust system and clutch. The collector car auction company RM Auctions, which handled the sale of this car, sold a similar Bond car in 2005. That car was never used in any Bond movies, it was used only for promotional purposes. Lee, the car's owner, had said he thought the car might sell for as much as $10 million. "$4 million is kind of the minimum I expected it to go for," said McKeel Hagerty, president of the collector car insurer Hagerty Insurance. "At any price, some car collector is feeling really cool right now." The identity of the buyer was not immediately known. The final price of $4.6 million includes a 12% buyer's premium charged by the auction company. One other 1964 DB5 was used in filming, but that car was stolen in 1997 and is believed to have been destroyed. Proceeds from the sale of the car are intended to support the Jerry Lee Foundation, an organization dedicated to researching and solving problems associated with poverty.